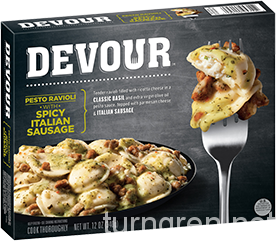 Devour is – from what I can tell – a somewhat recent entry into frozen meals. I’ve had two so far, this review is about the first of the two: Ravioli with pesto sauce and Italian sausage. It’s hard to break this into sections…when you’re eating it’s hard to pay attention to the specifics. Is the sausage in the ravioli themselves, or only in the sauce? I don’t know, because I was too busy stuffing my face. It was good. I mean real good. The only downside is the portion size is a little small, so you will want to supplement it with something else.